Long awaited dream has become the reality. After months of hard work, we are delighted to officially announce the launch of our parish website today on 5th August 2018 on the Parish feast of our patron St. Dominic de Guzman. I am reminded of St. Paul’s words to the disciple Timothy. He said; "Proclaim the message and make the preaching of the Good News your life's work". That is the challenge presented by the launch of the parish web-site; to bring the Good News to a much wider audience. Our goal with this new website is to provide our Parishioners/friends/visitors an easier way to learn about the Parish, its activities, different association’s contributions towards the development of the Parish etc. It will keep us informed daily of events in the parish; births, marriages, family events, parish events and diocesan news. At this time it will also be a vital means of keeping us up-to-date with the plans for renewal of faith in the parish and in the diocese. The following are some more reasons to launch this new website:. • Evangelization – A new design to highlight God’s Work happening in our Parish. • Communication – To provide the information we need at our fingertips. 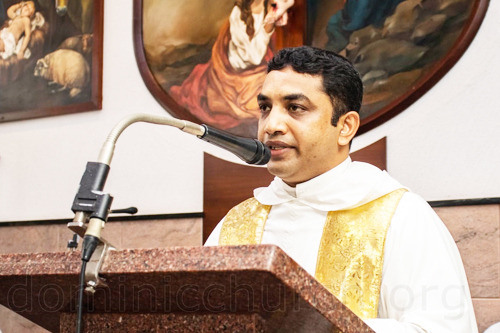 • Connections – Connecting the Priest and Parishioners, including new families and visitors to our Church’s prayer, activities and ministry. We will be constantly updating our content with helpful information, articles, pictures, ward news, Church announcements etc. The new parish web-site hopefully will be a source of information, inspiration and challenge to all. I congratulate all involved in the project and trust that it may be an instrument of renewal of faith for each and every one of us.